Tim May and Dan Miller's "Flatpicker's Guide to Old-Time Music" is a 160 page book (with 2 audio CDs) that is designed for flatpickers who want to study the rhythm playing of old-time rhythm guitarists and learn how to play solos to 11 great old-time fiddle tunes. The book is presented in two sections. 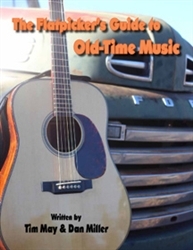 The first section (60 pages) presents a very thorough study of old-time rhythm guitar. This section emphasizes learning bass note selection and bass note runs and would be ideal for any acoustic guitar player who not only plays in an old-time setting, but any guitar player who plays in a small ensemble that does not include a bass player. If you play in a duo or trio that does not include a bass player, the rhythm ideas presented in this book will help you add a lot of texture and interest to your rhythm playing. In the second section of the book, Tim May and Dan Miller present 11 Old-Time tunes. For each tune they present the melody, plus two variations on the melody (intermediate to advanced level). They also present rhythm accompaniment ideas for each tune based on the rhythm information that was presented in the first section of the book. On the audio CD you also are presented with a guitar rhythm track, plus a mandolin lead track. Therefore, after you can practice your lead playing along with the guitar rhythm track and practice your guitar rhythm along with the mandolin lead track. The list of tunes can be found in the table of contents below. Included after the table of contents is a more detailed description of the book from the introduction written by Dan Miller. Introduction to "Flatpicker's Guide to Old-Time Music"
My good friend Tim May and I have decided to write this book for a couple of reasons. Both have to do with providing supplemental material for our 8 Volume Flatpicking Essentials series. In Volume 1 of that series "Rhythm, Bass Runs, Fill Licks" I spoke of how anyone who is studying acoustic rhythm guitar would be wise to go back and start with a study of what the old-time players were doing, and then follow the linear progression of technique forward through early country, folk, and bluegrass. A number of people who bought that book wanted to know where they could turn to study more about what the old-time guitar players were playing. The book you hold in your hands is the answer to that question. Here we have provided a very detailed study of the use of bass runs by old-time guitar players all the way up though some more modern style bluegrass runs. So, the rhythm section of this book is a supplement to Volume 1 of the Flatpicking Essentials course. Another comment that I received from individuals who were studying Flatpicking Essentials, Volume 1 was that they wanted to see more rhythm examples for specific tunes. In order to answer that request, we not only provide a very large section on the theory of bass runs and old-time rhythm, we also provide an example of rhythm ideas that you could use with all of the tunes that are presented in this book. Additionally, so that you can practice rhythm in the context of these tunes, we provide you with audio tracks of mandolin solos that you can practice with in order to improve your rhythm skills. The second reason for writing this book has to do with helping flatpicking guitar players build their repertoire. The tunes that are provided in this book are fiddle tunes drawn from the old-time tradition. We provide these tunes, both melody-based arrangements and more intricate arrangements, so that those individuals who have worked through Volume 3 of the Flatpicking Essentials series "Flatpicking Fiddle Tunes" can have some great tunes to work with in order to build their repertoire beyond the standard list of common flatpicking fiddle tunes. There is a standard repertoire in the flatpicking world and the majority of the most common tunes from that repertoire are presented in Flatpicking Essentials, Volume 3. Other standard flatpicking tunes can be found in the pages of Flatpicking Guitar Magazine and various other books and videos available on the market. By providing tunes from the old-time repertoire our goal is to add to the flatpicker's standard repertoire so that you don't have to play "Whiskey Before Breakfast," "Red Haired Boy," "Salt Creek" and the other standards at every jam session. Please note that we have designed this book for flatpickers and it is focused on helping flatpickers add to their rhythm technique and fiddle tune repertoire by studying some of what old-time players were doing back in the 1920s and 30s. This is not meant to be a book for old-time guitar players who wish to strictly study old-time music and stay true to old-time traditions. Some old-time musicians can be quite conservative about their music and the way it is played. More power to them! We believe that there is a place for what they are doing. They are preserving a wonderful musical tradition and they should continue to do that. However, we are not old-time musicians. We are flatpickers who play old-time tunes as well as bluegrass, newgrass, spacegrass, dawg-grass, swing, jazz, folk, Irish, and some rock and roll and blues thrown in for good measure. We don't mind mixing it all together. Having said that, we'd like to ask our traditional old-time friends to forgive us for stepping outside of tradition from time to time by adding some bass runs that some old-time purists might frown upon, or by including improvisations on the melodies of old-time tunes. Again, this is a book for the flatpicker who likes all kinds of music and doesn't mind mixing old-time technique with bluegrass, blues, folk, and other styles. This book is also for the flatpicker who jams or performs in a small ensemble that has no bass player. Even if you do not aspire to play old-time music, the rhythm techniques that are taught in this book will serve you well if you play in a duo or trio that does not include a bass. If you are a flatpicker and attend a bluegrass jam, feel free to play what is appropriate in the context of a bluegrass jam, however, if you attend an old-time jam, please learn and then play the style of music that is appropriate in that context. Tim May has provided a short explanation of the difference between the two types of jams on the next page for those who are not familiar with the old-time jam session.